Nearly two years after PewDiePie was widely criticized for testing the controversial limits of freelancer marketplace Fiverr (by paying two men $5 to hold up a sign saying “Death to all Jews”) he’s landed himself in hot water for promoting a YouTube channel that frequently posts anti-Semitic, racist, and white supremacy-related content. PewDiePie, whose real name is Felix Kjellberg, promoted the channel, ‘EsemicolonR’ — ‘E;R’ for short — with a swath of others at the end of one of his latest videos, The Verge was the first to point out. (Kjellberg has now deleted E;R’s channel from his list of recommended watches in the video’s description.) He specifically recommended a video essay about Netflix’s live-action adaptation of the anime Death Note, in which the detective character ‘L,’ who was Japanese in the original manga and anime, was played by a black man. In the video Kjellberg recommended, E;R jokes about and plays footage of the death of Heather Heyer, who was killed last year when a man drove his car into a group of counter-protesters at the white supremacist Unite The Right Rally in Charlottesville, VA.
Another of E;R’s videos proports to be about the cartoon Steven Universe, containing clips from the show — but in the middle of the three-minute video, E;R sewed in a series of headshots of Jewish public figures, including YouTube CEO Susan Wojcicki and Facebook CEO Mark Zuckerberg. They also added in a graph noting that “2% of the world’s population controls 96% of the world’s media,” echoing a conspiracy theory popular with anti-Semites that alleges Jewish people conspire to control the world by owning media companies. E;R’s channel has gained more than 20,000 new subscribers since Kjellberg’s shout-out, bringing its total to 220,000. You can see how that played out in the chart below. 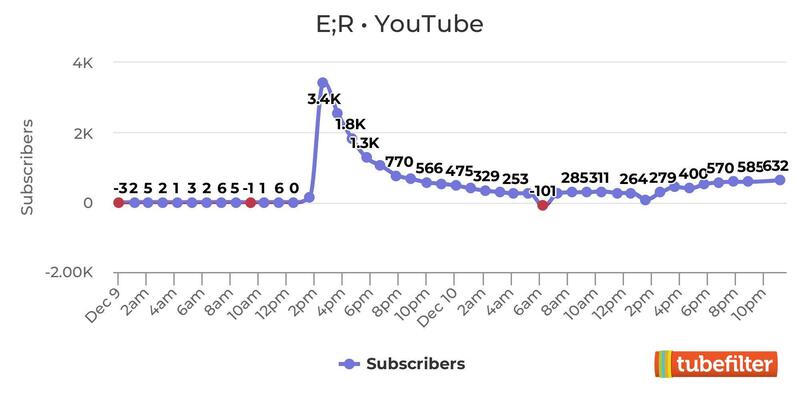 E;R generally averages a half dozen or so subscribers an hour, but that changed after the PewDiePie shout-out. Kjellberg posted his video at around 7 p.m. GMT Dec. 9, and at 2 p.m. GMT Dec. 10, E;R saw a spike of nearly 3,500 subscribers in one hour. 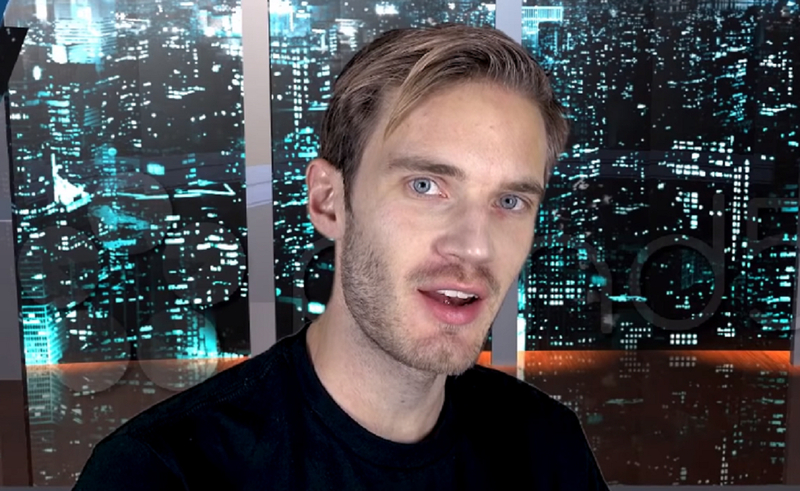 Kjellberg has received backlash from fellow YouTubers including The Young Turks host Hasan Piker, who posted a video of his own picking apart Kjellberg’s behavior and E;R’s videos. As of posting time, Kjellberg has not commented on his recommendation of E;R’s channel. Kjellberg has posted a video addressing the reaction to his E;R shout-out. You can see his full video below.